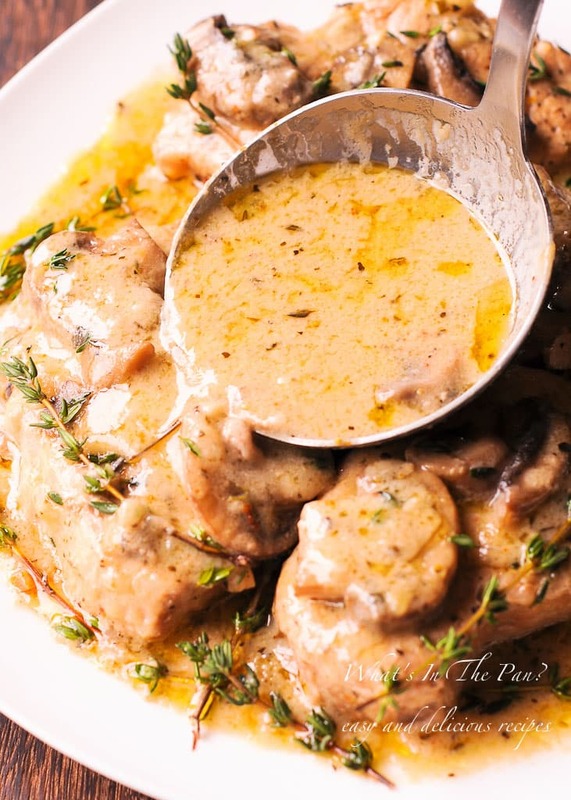 Instant Pot Pork Chops in Creamy Wine Sauce (Video) - What's In The Pan? 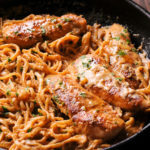 This is the BEST Instant Pot Pork Chops recipe: moist, fork tender and flavorful pork chops are smothered in creamy wine and herb sauce! That’s juicy pork chops done the right way! Perfect comfort food! After I made an insanely popular Pork Chop recipe, I knew it was time to repeat the magic. And create fall-apart tender pork chops in the instant pot. After all, Instant Pot Chicken and Rice came out well in the pot. As a result, I came up with this very juicy dinner recipe. And a very easy one too. 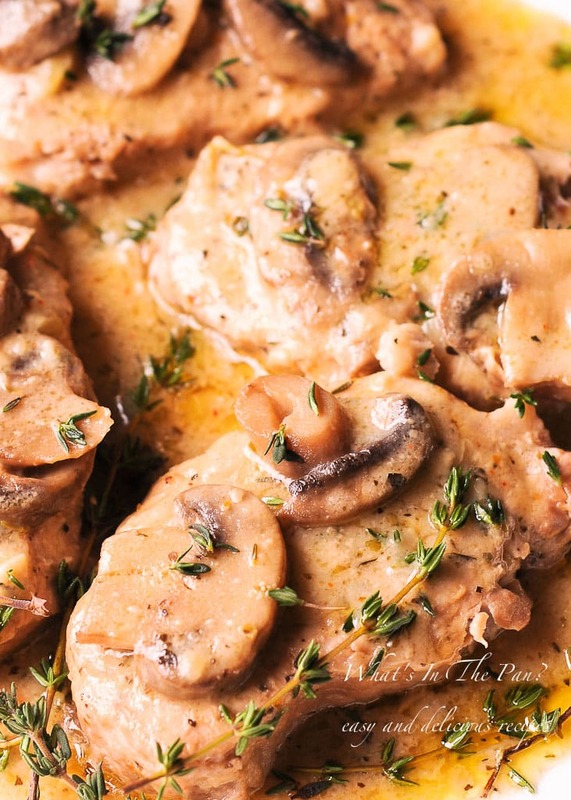 You will smother your pork chops in the plenty of flavorful mushroom gravy sauce. This amazing sauce can then be spooned all over the pork. And a side dish of your choice! By the way, I recommend to spoon it all over Instant Pot Mashed Potatoes. Who needs a slow cooker when you have a pressure cooker? Thick and boneless pork chop take about 8 minutes to cook. By the way, they are the ones you see in the picture. They are about 1.5 inches thick. Thin and boneless take less time, about 4 minutes. Thick and bone in pork chop required more time, around 12 minutes. And thin and bone in pork chops take 10 minutes. Finally use same time for frozen pork chops. But keep in mind that Instant Pot will take longer to come to pressure. As a result, the overall cooking time will be longer. While the Instant Pot pork chops are being pressure cooked, it’s time to whip up some roux. This will thicken the white wine and mushroom gravy! To do so, we’ll need to turn on the stove. Also, we will need a small saucepan. Once you have those ready, add butter and allow it to melt. Next, slowly whisk in flour, one tablespoon at a time. Now add heavy cream and continue whisking until the mushroom gravy is thick. 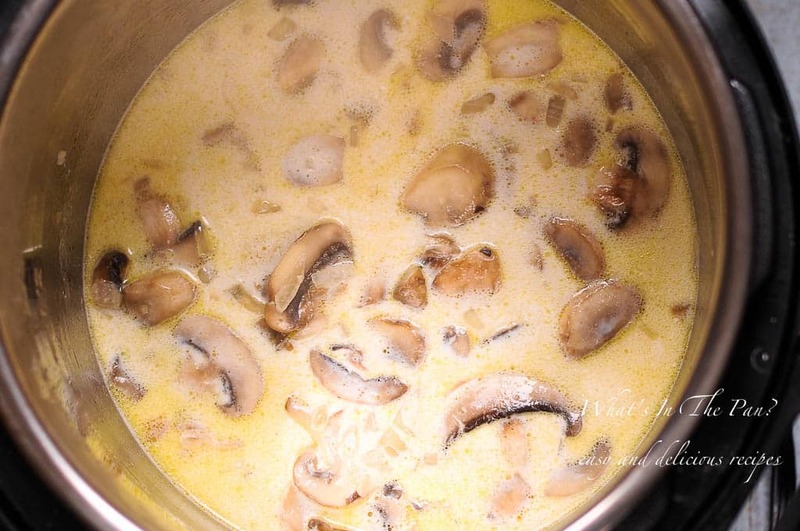 I thickened the creamy mushroom and wine sauce here AFTER pressure cooking stage. All I did is make a roux on the stove top. Just to be safe it’s best not to include ANY flour or thickeners before Instant Pot finishes cooking. When do I add roux to the Instant Pot? Pressure cookers thrive off of the steam pulled from the liquid that’s trapped inside. 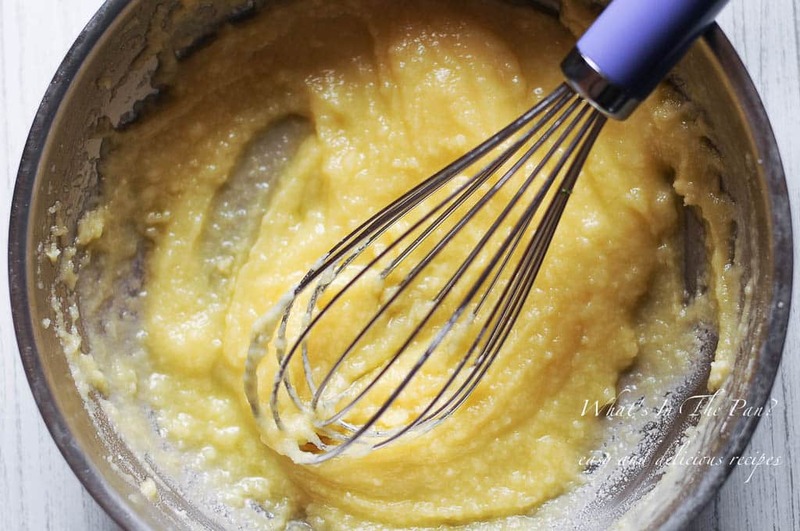 When cooking a thick sauce, adding a roux to the mix too soon can have a negative effect on the way it cooks. Because less steam is released from the thicker liquid. For the best results, always add the thickener (like a roux) after pressure cooking is done instead of before. I added my roux right into the pot after 10 minutes of Natural Release was over and mixed it with a whisk. And I removed instant pot pork chops prior to adding it in. Appearance: flour makes a gravy opaque and can dull or lighten the color. Cornstarch on the other hand yields a clear, shiny sauce. Flavor: You need to cook flour enough so that it loses its raw flavor. While cornstarch doesn’t have much flavor on its own. We use roux to suspend fat into sauce. And the biggest thing a roux has to offer is richness. But with corn or potato starch you lack the richness because you cannot trap the fat within the liquid. I also find that cornstarch tends to deaden flavors more than flour does. As a result you need to make sure to season your liquid is well before adding your cornstarch slurry. 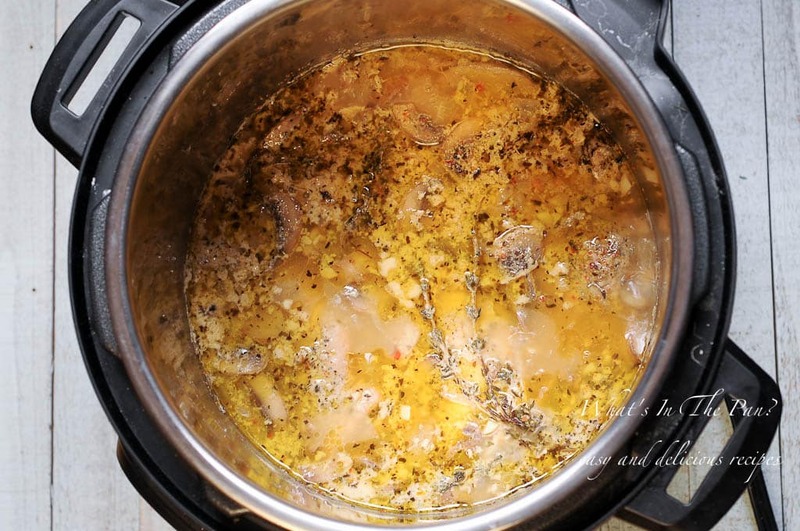 For these reasons I prefer flour roux in this creamy Instant Pot Pork Chop sauce (gravy). It tends to cling better. Thickened cornstarch will run off – we don’t want that. However, if you are gluten free, using cornstarch instead of flour is a great option! Simply mix 1.5 tablespoons of cornstarch with just enough water and then add the mixture to the pot after pressure cooking is done. Season pork chops on both sides with salt, pepper, garlic powder and Italian seasoning. Hit Sauté button on the Instant Pot to preheat it. Next add olive oil, mushrooms, onions and garlic. 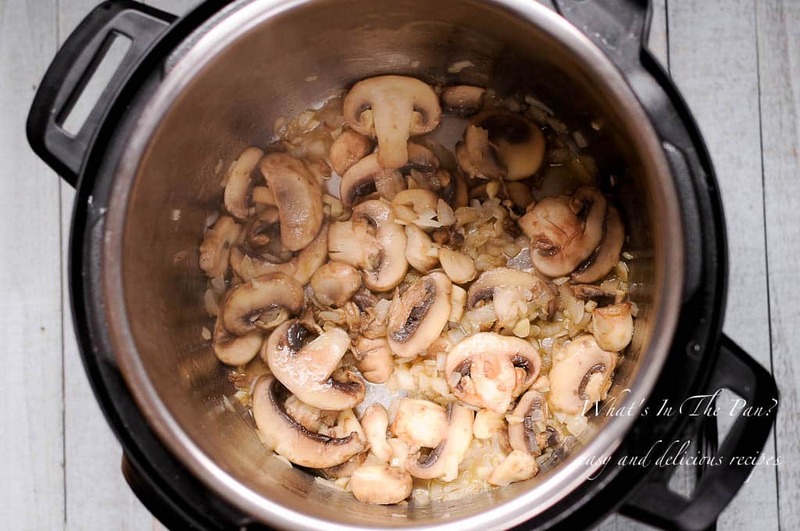 Sauté for 2-3 minutes until mushrooms are soft and onions and garlic softened. Make sure to deglaze after sautéing with wine! Not only will this step prevent Burn warning by removing all bits and pieces off the bottom of the pan, but it will also provide an essential flavor to the sauce. After deglazing with wine, add chicken stock. Pour heavy cream into the Instant Pot. Mix heavy cream into the chicken stock. 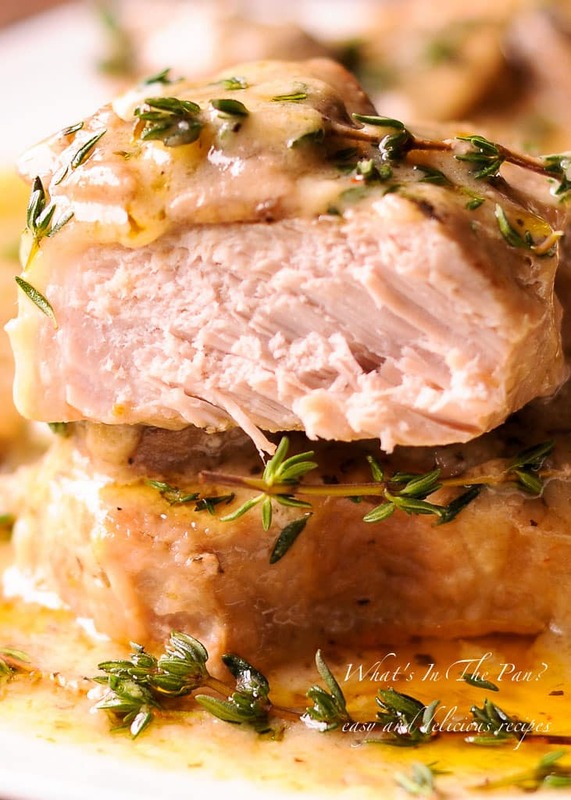 Place pork chops on top of the sauce. Add a couple of thyme sprigs on top for flavor. Do not submerge the pork chops all the way into the sauce. Lock the lid, set the vent to Sealing, and cook on High Pressure for 8 minutes. It will take 10 minutes to come to pressure. After 8 minutes of pressure cooking and then 10 minutes of natural release, and instant pot pork chops are done! While the instant pot is doing its job, let’s prepare the roux. Melt butter in the small saucepan. Then add flour to it and also heavy cream. Once you combined everything, set aside. First things first, push “Cancel” to cancel the reheat mode. Now the digital display will show “OFF”. At this point do not turn off the pot, but wait for 10 minutes. After 10 minutes, turn “Venting” knob to venting position. Allow remaining pressure (steam) to vent. Lastly, turn the lid to “Open” position and open the pot. The delicious instant pot pork chops are somewhere there under all this mushroom gravy goodness! 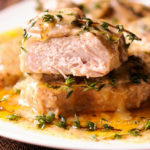 Remove the pork chops onto a plate and now whisk that prepared roux straight into the pot while it’s still steaming hot. As I mentioned before, you simply can’t go wrong serving these instant pot pork chops over Instant Pot Cheesy Garlic Mashed Potatoes. I’m also a big fan of serving it with something green on your plate, such as Brussels Sprouts with Bacon and Mozzarella. Prefer a salad instead? How about Brussels sprouts Cranberry Pecan Salad. 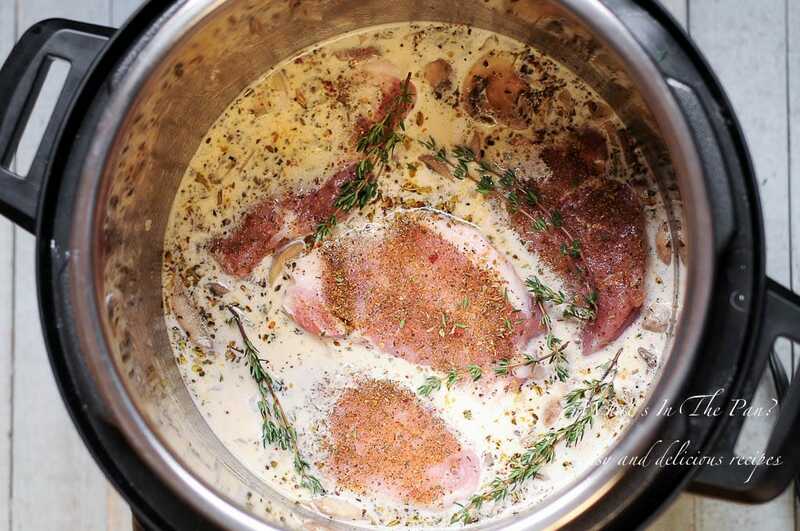 This is the BEST Instant Pot Pork Chops recipe: moist, fork-tender and flavorful pork chops smothered in creamy wine herb sauce! 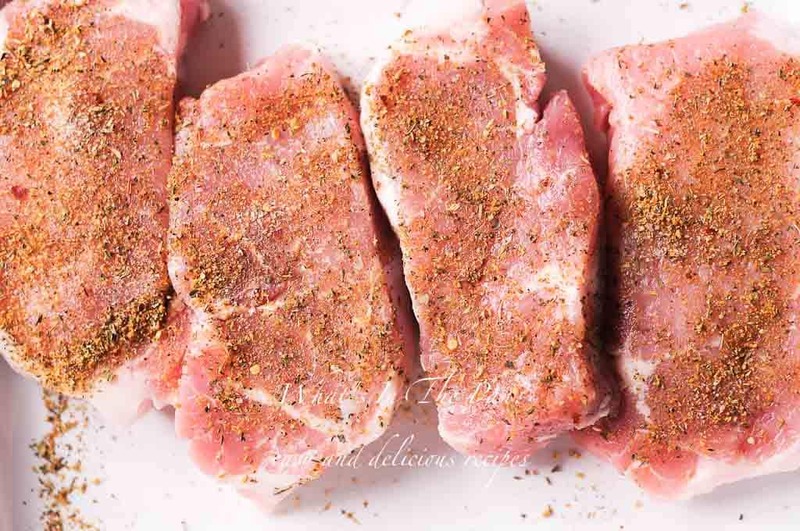 Season the pork chops on both sides with salt, pepper, garlic powder and Italian seasoning. Set aside. Preheat IP by pushing Sauté button. Add olive oil, chopped garlic, onion and sliced mushrooms. Cook until mushrooms, garlic and onions are translucent. Deglaze by pouring white wine into the pot to make sure that to get all bits and pieces from the bottom of the pot. This will ensure that no Burn warning will appear. Add chicken stock, heavy cream, salt, pepper and Italian seasoning. Stir to mix. Add seasoned pork chops into the pot. Place thyme sprigs on top of the chops. Place the lid on the pot and set the valve to sealing. Press Pressure Cook (or Manual), High Pressure, and set cooking time for 8 minutes. Allow for the pot to come to pressure (it took 10 minutes for me), pressure cook for 8 minutes, and then allow 10 minutes of natural pressure release. Release any remaining pressure from the pot and remove the lid. In a small saucepan add butter and allow it to melt. Slowly whisk in flour, one tablespoon at a time. Add heavy cream and continue whisking until gravy is thick. Remove pork chops from the IP before adding the roux! 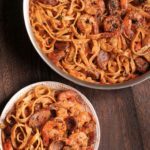 Add the roux (flour mixture from above) into your Instant Pot and mix using a whisk. The gravy is ready! Pour the gravy over the pork chops, and serve with mashed potatoes or roasted vegetables. I used the 1.5 inch boneless loin chops. Cooked it according to directions, and the sauce was spectacular. the chops not so much. they were tough and dry. shouild I decrease cooking time nex time or do the same recipe in a crock pot and cook-6 hrs? I’m sorry to hear that chops were tough! I would decrease cooking time by 2 minutes. If I use 8 thin boneless chops instead of 4. Should I double all the other ingredients ? I wouldn’t. You will have enough sauce and mushrooms as it is. This recipe will have sauce leftover. 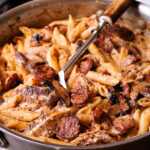 I used a regular pressure cooker chops were a little dry but the flavor….spot on!!!! I believe for this cut of pork I used it was more tender than it would have been any other method.. 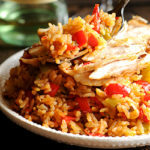 This recipe was easy to follow, tasted great, and my family all enjoyed it. We’ll definitely add this to our rotation. I’m so glad you liked it and excited that you will be making it again! The recipe only calls for 1/2 cup cream, but the directions call for cream twice with no mention of how much each time. Please correct. The remaining amount is further down in the recipe (I divided the cream between the pork chops and the roux). I see though why it’s unclear. Maybe I should just combine them in one place instead of dividing it? Made these exactly as shown. Chops were chewy, and tuff. Sauce was great. This recipe might do well as a simmer all day in a slow cooker, to make chops tender. The sauce was amazing – the pork chops came out very dry despite being 1.5 in thick like mentioned in the recipe above. I’d be interested to know if browning them first and then cooking slightly less would make them more palatable. It was a huge hit with my family tonight. Definitely a keeper. Thanks for sharing. new at this, but….looks like add heavy cream to IP + other ingredients, and also to roux… which is correct? 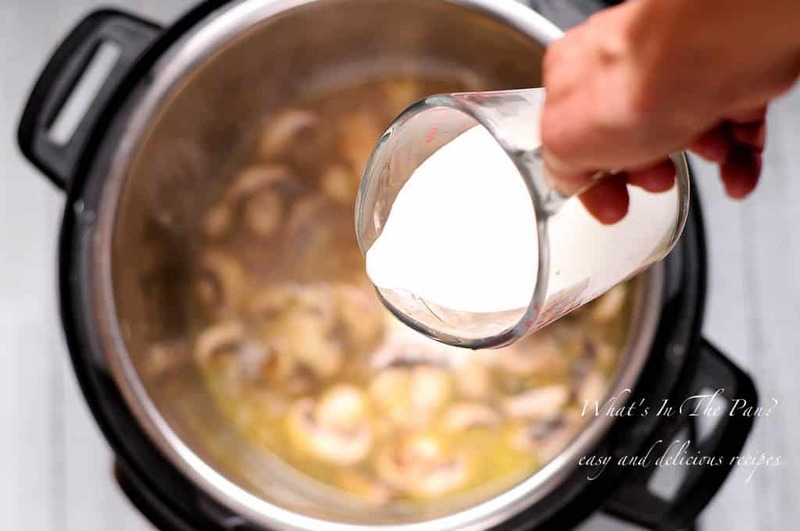 You add heavy cream to IP – correct and pressure cook with heavy cream in it. 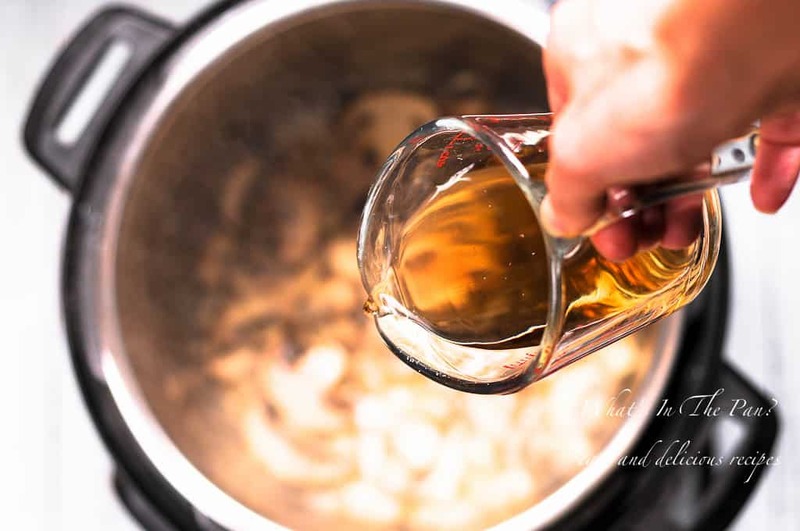 But you do not pressure cook with the roux – you add it after pressure cooking is over. And yes, you also add roux to the instant pot but only AFTER pressure cooking. I added 1/2 cup of heavy cream to IP (with chicken stock and other seasonings) and then another 1/2 cup to the roux. All in all, it’s 1 cup of heavy cream in total (split between the roux and the initial sauce).